BONUS TRIVIA! 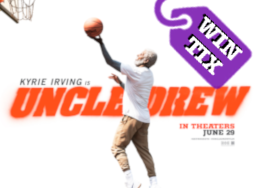 Tonight, during your normal trivia night at Penn Social, you'll have the opportunity to win great Uncle Drew movie prizes! More about the film: "After draining his life savings to enter a team in the Rucker Classic street ball tournament in Harlem, Dax (Lil Rel Howery) is dealt a series of unfortunate setbacks, including losing his team to his longtime rival (Nick Kroll). Desperate to win the tournament and the cash prize, Dax stumbles upon the man, the myth, the legend UNCLE DREW (NBA All-Star Kyrie Irving) and convinces him to return to the court one more time. The two men embark on a road trip to round up Drew's old basketball squad (Shaquille O’Neal, Chris Webber, Reggie Miller, Nate Robinson, and Lisa Leslie) and prove that a group of seniors can still win the big one. After a successful five years as a fan-favorite digital episodic series, originally conceived by Pepsi, UNCLE DREW, will hit theaters June 29, 2018."